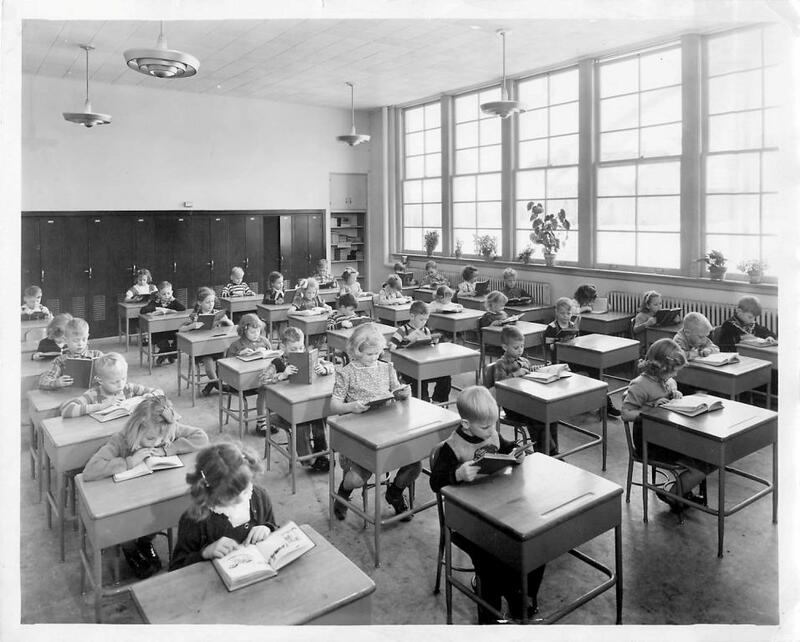 Beginning in 1932, during the years of the Great Depression, a Christian School Benevolent Association was formed for the purpose of assisting parents who were unable to pay the tuition for their children attending the various Christian schools in the city. When these parents, who were members of the First Protestant Reformed Church of Grand Rapids, could shoulder this burden themselves again, the C.S.B.A was disbanded. But before they disbanded, the board, realizing the need for distinctly Protestant Reformed education, met in the basement of First Church on January 28, 1937 to discuss the possibility of starting our own school. On April 15 of that same year, a mass meeting was held for the purpose of organizing into a society. This society was called the Protestant Reformed Society for High School Education. On May 10 the first board was elected. This board was to do much of the ground work for what would eventually become the Association for Christian Education. They met on numerous occasions over the next couple of years, establishing a constitution, taking census, studying requirements for operation of a high school, and collecting data on teachers, pupils, and buildings. This board's deliberations, however, led them to believe that the interest of our people could better be served in the establishment of a grade school rather than a high school. On April 18, 1941, this High School Society was disbanded and the Society for Protestant Reformed Education was organized. Seven men were elected to the board: D. Bloem, Sam Bylsma, Art Haan, John Kuiper, Dirk Monsma, John Piersma, and Jacob Piper. Within a month, our name and present constitution were adopted. In 1942 the Society authorized the board to purchase a plot of ground on Adams Street, but this wasn't completed until 1944 because of lack of funds. At that time, the board learned that the property had new owners who wanted $4,500 instead of $4,000, with terms of $2,500 down and the balance on easy terms. The board decided to borrow the money from the bank to purchase this property, and they reported to the society that the down payment had been made and mortgage payments would be at least $50 semiannually. After this concrete step was taken, things began to happen at a more rapid pace. It seems our people began to sense that the realization of the Society's goal was now within sight. The treasury began to build up -- churches sent collections, societies donated, and the Ladies' Auxiliary became a big help with their financial support. Final payment was made on the property in January, 1945. In November 1945 a census was taken which revealed that we could expect approximately 200 children to be enrolled in our own school. In the spring of 1946, a sign proclaiming "The site of a School for Protestant Reformed Education" was erected (cost of $11.20). The board proposed to the Society that a complete school be built during the next year, with an opening date of September 1947. An architect was retained, who advised the board that their plans were not suitable and that with war restrictions on building materials, the September 1947 starting date was not realistic. A financial drive was held in the fall of 1946, which netted the sum of $12,000. At this time the board considered tentative plans for a basement school. The decision was made to contact an architect and get his reaction to those plans, and also the approximate cost of building. Mr. J. Haveman was engaged, and he advised not to build a basement school because it would be too costly. 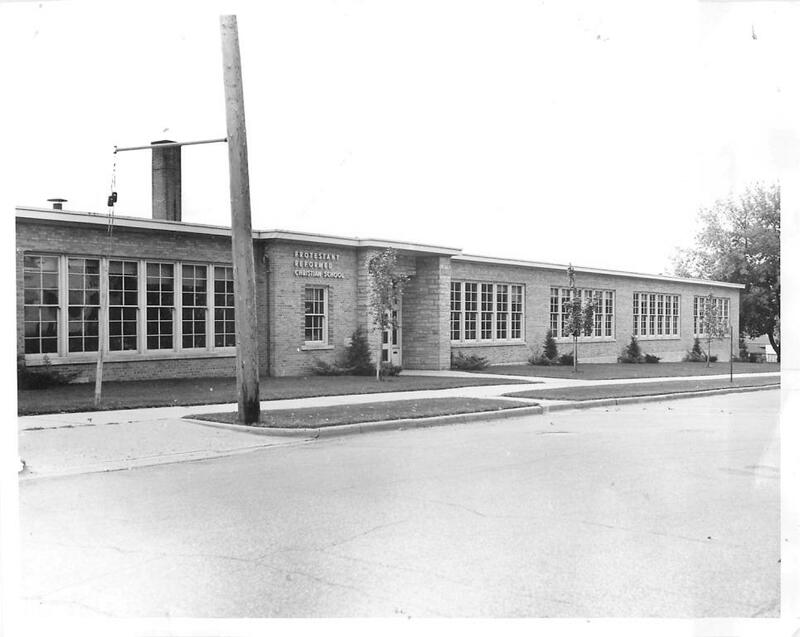 Early in 1947, the building committee began negotiations to purchase four lots on Fuller Avenue adjacent to the school property for the sum of $2,000. This purchase was necessary to the building plans that were nearing completion. This transaction was completed by August 1948. The treasury continued to grow. In April 1946, the treasurer reported a balance of $11,633.81 and $75.00 in war bonds. In October 1947, another financial drive was held which brought in $22,000. This was a very large sum for this time, and shows that the people were very committed to this project. By the end of this year the architectural plans were completed, showing the new eight-room school building on the highest level of the building site. 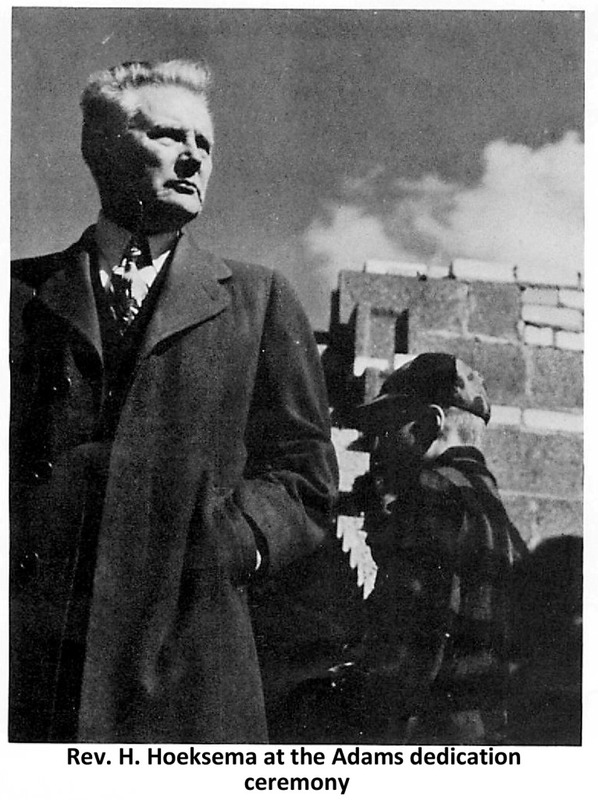 At the society meeting held January 15, 1948, in view of the high bids received, the building committee decided to have our own people build the school and have one of our men supervise the job. 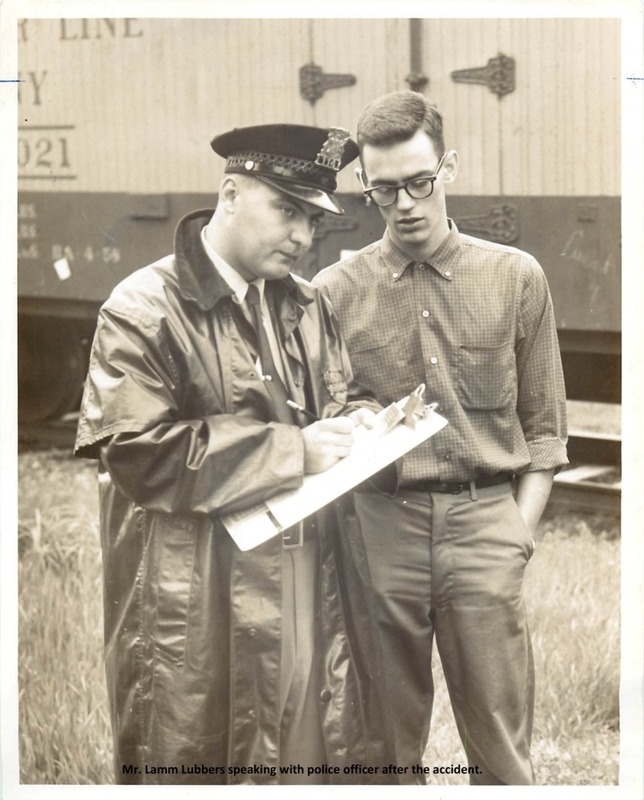 Mr. S. Bylsma was appointed to supervise the building of the entire structure. In November 1948, another financial drive brought in approximately $12,000. 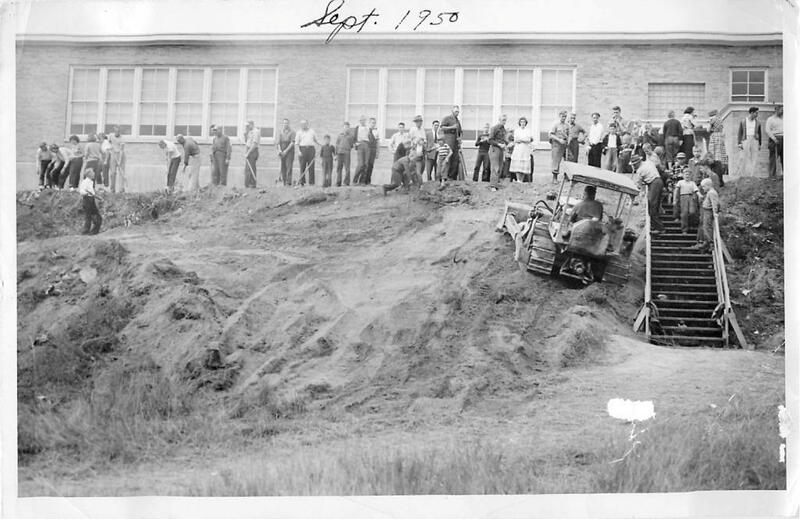 On January 21, 1949, the building committee reported that the foundation, walls, and fill-dirt project was finished. Brickwork was started on March 18 1949. On April 2, 1949, cornerstone-laying ceremonies were held. A time capsule was inserted behind the cornerstone. Rev. R. Veldman opened with prayer, Rev. H. Hoeksema addressed the gathered crowd, Mr. Don Knoper led the singing with his trumpet, and Rev. C. Hanko closed with prayer. Enrollment was held in April, requiring a $5 deposit. By June all the teaching contracts had been signed -- six teachers and one teaching principal. ...dedicated to the proposition that all academic subjects be taught from a Protestant Reformed perspective! 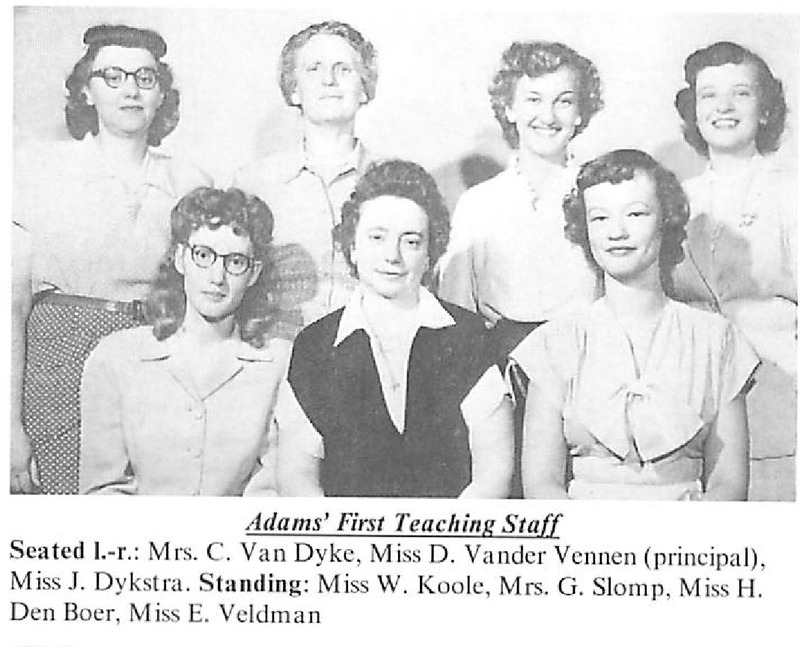 With great joy, and after all the years of anticipation and hard work, the first day of school at Adams Street Protestant Reformed Christian School was begun on September 6, 1950. Two hundred thirty-five students and teachers started school in a building dedicated to the proposition that all academic subjects be taught from a Protestant Reformed perspective! A dedication program was held on September 14 in First Church to mark this momentous event. Already in the fall of 1951, just a year later, expansion was necessary due to larger than expected enrollment. The new $50,000 addition included two more classrooms, bathrooms, janitor's room, an all-purpose room, and a kitchen. For the next two years the school had an enrollment of nearly three hundred students. In 1953 church schism drastically affected enrollment. Many left our fellowship during this controversy. In June of 1954 the enrollment was two hundred ninety, and by September of that same year it had dropped to one hundred and twenty-three. Since there was now an excess of space and equipment, desks were loaned to various schools, one classroom was used by the Protestant Reformed Theological School for seminary classes, and rooms were rented to other schools while they were completing their own building projects. Though enrollment never again reached the level of 1953, the school has continued to prosper spiritually through all the ensuing years. April 1956 marked the 15th anniversary year of the school society. A program was held to commemorate this milestone. 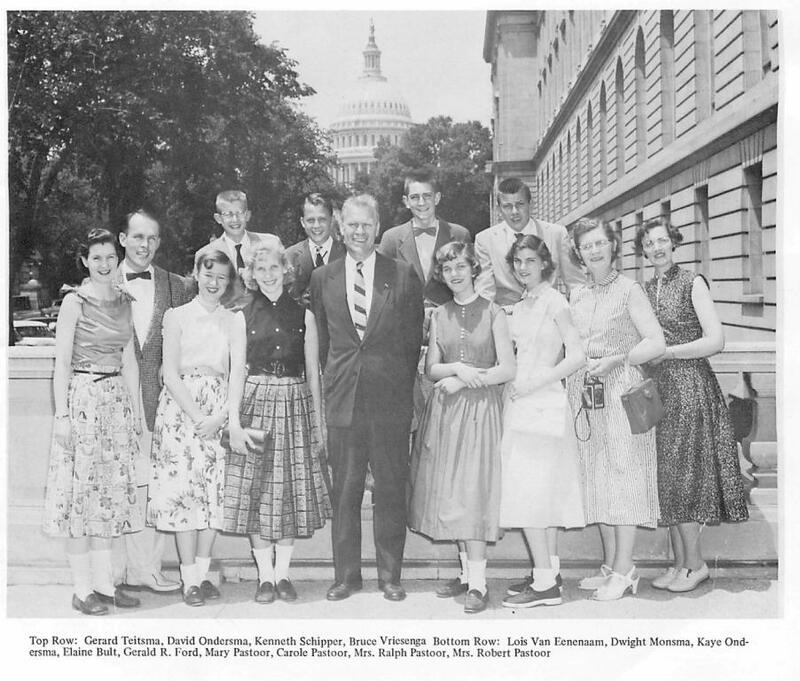 During that same year, a new bus garage was completed, and the graduating class took a very enjoyable class trip to our nation's capital. They had an opportunity to meet with their congressman (and future President), the Honorable and late Gerald R. Ford. 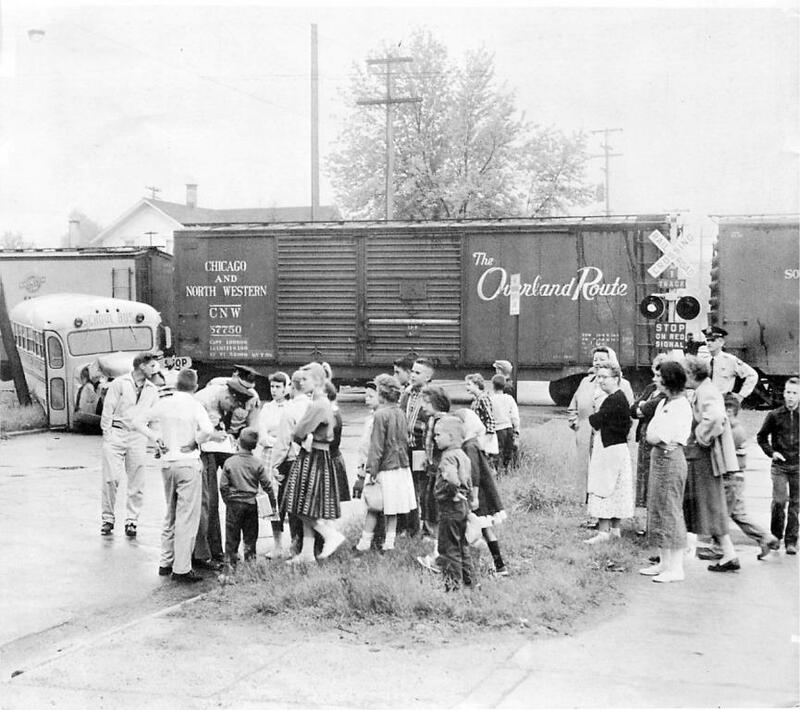 In May 1959 while on its way to school, one of the buses stalled on the railroad tracks on Diamond Avenue just north of Michigan Street. Just after the students were evacuated by their 20-year old driver, Mr. Lammert Lubbers, the bus was struck by a freight train. 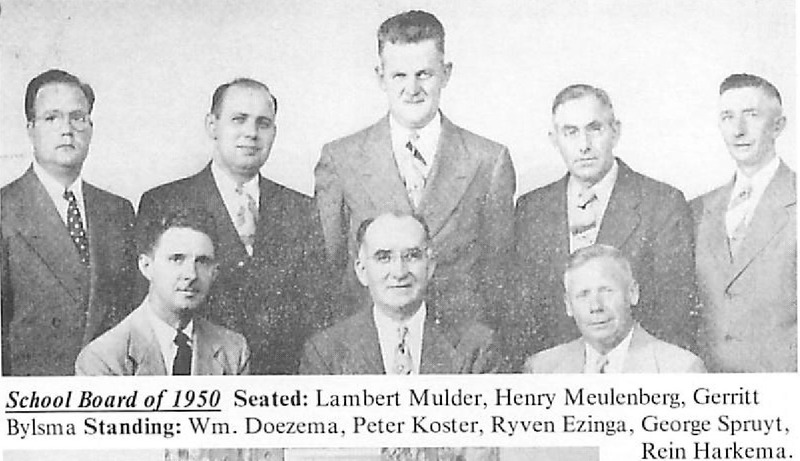 Mr. Lubbers, a graduate of Adams, served many years as the principal of the Protestant Reformed Christian School in South Holland, Il (currently Dyer, IN). June 1960 was a big milestone in that this graduating class was the first kindergarten class, and thus, the first class to have gone all the way through Adams. The graduating class of 1974 contained the first two second generation graduates, Terri Gleason and Doug VandenBerg. September 1987 brought another decision time to Adams. The expansion-relocation committee met to consider whether to relocate or remodel and expand the existing building. After soundly defeating a board proposal to renovate and expand for $430,000 in October 1987, the Society voted unanimously in favor of a second proposal totaling $290,000 to remodel the existing gym into a library and music room, remodel the front entrance, remodel the teachers' lounge and office area, construct a gymnasium and locker rooms, replace the old roof, carpet the corridors, and lower the ceiling lights. This building project began in the summer of 1989 and was completed in January 1990. An open house was held on May 4, 1990, to show the completed renovation and construction project, and commemorate the 40th anniversary of Adams School. On April 13, 1995 Adams received an offer from Grand Rapids Public Schools to purchase the 1150 Adams Street property. This offer was accepted on July 6 of that same year, and the school sold for $600,000. Now came a difficult time of trying to find a suitable site for a K-9 grade school. After considering three different sites: 56th St. and Burlingame area, First PR Church area, and 36th St. and Kalamazoo Ave. area, no headway was made, since none was approved by a majority of the Society. The board then began a search for a temporary site to hold classes for the coming school year. Provisions were made to split the grades, among three sites: Covenant Christian High, First Protestant Reformed Church and Hahn-in Christian Reformed Church. In April 1996, the board learned that Freedom Baptist School was putting their K-3 school building on the market, and it was located very near the 56th and Burlingame site that had been previously considered. On April 9 Adams Association met to consider two proposals: Relocating to the First Protestant Reformed Church site (Michigan St. near the East Beltline) or purchasing the Freedom Baptist School (Byron Center Ave. near 56th St.). The vote was 2/3 in favor of purchasing the 5539 Byron Center Ave. site. Now everything in the school at 1150 Adams St. had to be packed up and moved. What a huge job that was -- 46 years' worth of accumulated "teaching stuff"! A last program was held at the Adams St. school building on June 8, 1996. This was a very moving night of reminiscing and thanking God for caring for us these past 46 years. The 1949 cornerstone was removed (and brought to the new building) and the time capsule was opened. It contained a brief history of the school society from its inception during the Great Depression to 1949, when the dream became a reality at 1150 Adams St. The cornerstone also contained a copy of the constitution of the Association, and a copy of the dedication program held in 1950. Since the new building was only meant to hold a K-3 school, on July 1, 1996, Adams Association approved the construction of three classrooms and restrooms to add to the existing six-room school. These new rooms were constructed in sixty days, and were ready to use on the opening day of the following school year, September 1996 -- our first year at this new site. On February 10, 1997, the Association approved the construction of three additional rooms, which helped tremendously the following school year , since many classrooms were still doing "double duty". On June 10, 1998, the first two third-generation students, the now Rev. Dan Holstege and Doug Mingerink, graduated from Adams. The summer of 1999 brought with it the start of another construction phase. This time, the remodeling of the original building purchased three years earlier was completed. It involved leveling of floors, removal of walls and restrooms, expanding office areas, re-configuring to make a teachers' workroom, computer room, and resource room. New carpet, ceiling, wiring, lights, and ventilation system were also added. Upon completion of the remodeling, construction began on a Phase III addition to add a gymnasium, kitchen, restrooms, science room, and storage. Included was an expanded parking lot and exterior landscaping. The latest addition was put into service on November 6, 2000. Over the years, other noteworthy events took place, such as the organization of the Mothers' Club and Boosters' Club, as well as the the Adams Foundation. Much appreciation must be given to those organizations whose hard work aided in providing financial support to purchase educational equipment, athletic equipment, band instruments, and even school buses. May God grant us grace to be faithful to our calling to train up His covenant seed in the way that they should go. "Let us, therefore, look to Him in the future and with zeal and dedication work for the cause of Christian education as we have it at Adams School, being confident that the Lord our God will bless our efforts and use them for the spiritual well-being of our covenant seed and His Kingdom." Copyright © 2019. 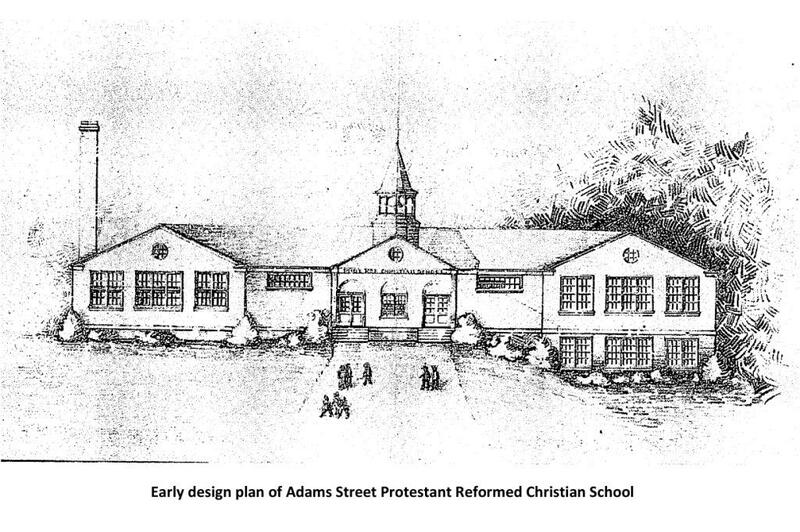 Adams Protestant Reformed Christian School.